Coach's Corner - "Gilligans Island" cast signed/guaranteed hardback book. 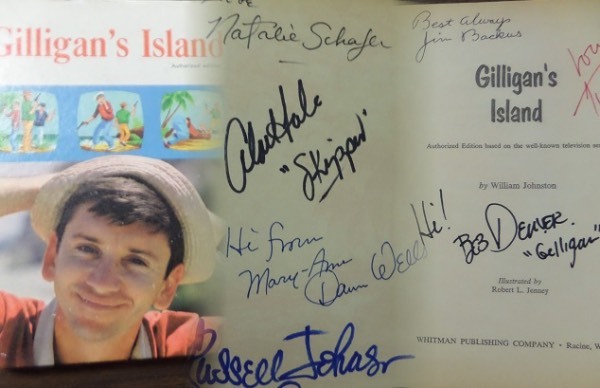 Go Back to Lot List "Gilligans Island" cast signed/guaranteed hardback book. This vintage hardback comes hand signed by all 7 castaways and grades as good as it gets. All but 2 are now deceased, and the 3 year long, 1964 comedy lives on forever! Of course Bob Denver, Jim Backus, Tina Louise, Dawn Wells and the rest have signed, and value, with our guarantee that it will pass JSA, PSA or any other test, is $1500.00.You will NOT be disappointed!